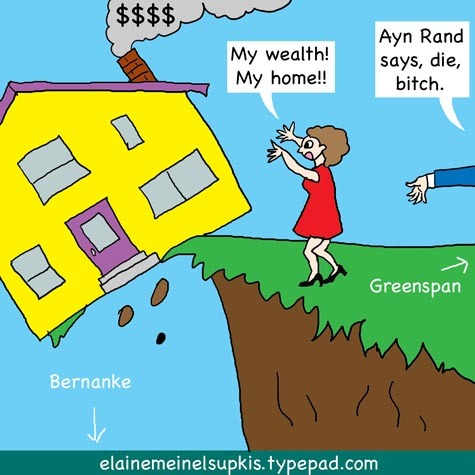 Greenspan and his puppy, Bernanke, both think everything is hunky dory, on track, managable, smooth sailing and all the stuff the Captain and the First Mate of the Titanic must have said the first two hours after hitting that iceberg. Or perhaps as a tsunami, one can see it from afar but no one believes it will sweep all the houses and people away. People wonder why the world assessment of the value of the dollar suddenly had a very nasty shiver of doubt. What was so striking about Friday’s sudden drop was the apparent absence of any real news to provoke it. Usually such sharp falls follow an event — a grim piece of economic news, a geopolitical event of note, or a pronouncement (or gaffe) from a government official or central banker. But this time it was the absence of news that seemed to weigh on the dollar. That might just have been down to the thin trading in New York (where markets were still sluggish after Thursday’s Thanksgiving Day holiday), but it seems more likely that this very lack of a trigger suggests the dollar’s fall was down to the acceleration of longer-term trends. Some traders cite as one of these trends continuing portfolio adjustments by central banks. In Beijing, it is true, officials keep reminding markets that China needs to diversify its foreign reserves holdings away from their dollar dependency. But it is hard to take this too seriously. The last thing that the Chinese want is a run on the dollar. Just as Keynes noted that when you owe the bank a million dollars, it’s the bank that has trouble, so for China, when you’re sitting on $500 billion of US treasury securities in your central bank vaults, you’re at least as dependent on the US Government as it is on you. I'll give a clue: the world saw Iraq's Shi'ite President struggle all that week to bolt to Iran and ask for the Iranians to invade Iraq! This was a stunning reversal of the American program for dominating Gulf oil and using the dollar forever as the fiat currency under the aegis of the Roman Imperial Eagle. Now, all parties in the key oil pumping sector of the planet are realighning along some very astonishing lines. And the loser in this sudden flipping and flopping is the USA! Here at home, the NYT wonders about the possibility of Democratic voters forcing an end to the 'Flat Earth/Free Trade' New World Order. The populists argue that the national income has flowed disproportionately into corporate coffers and the nation’s wealthiest households, and that the imbalance has grown worse in recent years. They want to rethink America’s role in the global economy. They would intervene in markets and regulate them much more than the Rubinites would. For a start, they would declare a moratorium on new trade agreements until clauses were included that would, for example, restrict layoffs and protect incomes. Ah, the verboten topic: tariffs and barriers! We sell so little to the rest of the world at this point, to the tune of around $200 + billion a year, stopping or slowing 'trade' might stop the immense hemmoraging of our money which is flowing out and then coming home as loans with compound interest attached. No system can run like this for more than 50 years and we are close to that, the last time we had a trade surplus was in 1970! 37 years of continuous deficits and right they are running off the charts at this point! As my blog has pointed out for two years now, the Boeing-boing-boing is all that is left of our export balance of trade and 90% of these purchases are by governments interested in controlling American foreign policy. It marked the third month in the past four that orders have either fallen or shown no gain, providing evidence that the nation's factories are beginning to feel the impact of the slowdown in the overall economy. The 8.3 percent drop in orders for durable goods, items such as airplanes and autos that are expected to last at least three years, was the largest one-month decline since a 14 percent plunge in July 2000. It followed an 8.7 percent surge in September. Both October and September were heavily influenced by demand for commercial aircraft, which fell by 44.5 percent last month after airplane orders had nearly tripled in September. Are airlines expanding? No? Oh, in CHINA and of course, the UAE are willing to buy jets to be outfitted as private toys for the super-rich slave drivers of that kingdom right on the lip of the Shi'ite volcano in the Middle East. Refusing to understand that much of our commerce that appears in the black side of the ledger are there only for political strategic reasons and not because we are fantastic traders and producers is highly important for Americans to understand for remaining childish and silly and not looking beyond the curtain means the termination of our empire and bankruptcy. All the fools giving economic information have resorted to total lies because they are scared people will figure out the truth and panic. "As expected, existing-home sales appear to be stabilizing, fingers and toes crossed," said David Lereah, chief economist for the Realtors. Market fundamentals are improving, he said. Read the full report. Median sales prices fell a record 3.5% year-over-year to $221,000, the third decline in a row. Since 1968, when the Realtors began collecting the data, prices had never fallen three months in a row on a year-over-year basis. "Falling prices are "a good thing," Lereah said. "Sellers are cutting their price enough to encourage sales," said Pat Vredevoogd Combs, a Realtor from Grand Rapids, Mich., and president of the NAR. Hey, they are now having auctions here! That gets great sales! Real low prices! If you drop prices low enough, I might show up and place a bid. I bought my first home in the middle of the Dark Ages of the late 1970's when interest rates were above 10% and nothing was moving. I have bought and sold properties through several boom/bust cycles. And always, always, when it sets in motion, everyone frantically drops prices and sweetens deals and then run like mad to close. Prices fall. Then they momentarily stabilize as the final sales eke past the falling guillotine and then the real fall commences: instead of rapid drops, people fooled by the final flurry of sales cling to the hope their places will be sold at a fairly high price and thus, become stubborn about dropping prices. This goes on for THREE YEARS with the prices crawling lower and lower and lower and gloom gets deeper and deeper until it hits bottom and people like myself begin to show up and make purchases. Iron rule of real estate that should be engraved on every bank and real estate company sign: ALL housing booms last 5 years and ALL housing busts last 5 years. Except the Great Depression. Gads. And here are the unhappy figures for October. No one cuts prices except if forced. It begins with only one or two people dropping prices. Then ten then hundreds. Most people, seeing sugar plum real estate fairies dancing in their heads, never drop their prices until it becomes quite laughable. Seeing faded 'For Sale' signs draped with spiderwebs is always rather dryly amusing. I know of more than one enterprising and greedy person who thought their rather ordinary dwellings would garner them profits of over $400,000 above the price they paid. Neeedless to say, the original mortgage, far from being paid off, often has been doubled or tripled. And unlike all other housing busts, THIS is the killer! People in their late fifties, needing a smaller place, preparing for retirement, can't cash in on the accrued value of their homes, they are in hock and can only unload if it rises greatly in value. Bernanke said overall inflation had been fuelled by a spike in energy prices that has been mostly reversed. but added that "the level of core inflation remains uncomfortably high," Bernanke said. WASHINGTON - Even with the economy in a slowdown mode, Federal Reserve Chairman Ben Bernanke made clear Tuesday that policymakers want to see inflation continue to recede, suggesting the Fed probably won't be cutting interest rates any time soon. In his most extensive comments on the economy since summer, Bernanke struck a largely positive tone that the economy should be able to weather the strains coming from the housing slump and the struggling auto industry. The slowdown "appears to be taking place roughly along the lines envisioned," Bernanke observed in remarks to the National Italian American Foundation in New York. What? 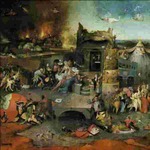 Bernanke's vision is Hieronymus Bosch? If he is bland about this developing meltdown, I think he should hire Baghdad Bob as his spokesman. This level of cluelessness is scary. Greenspan told everyone to take on adjustable rate mortgages that add onto the principal just last summer! NEW YORK - Former Federal Reserve Chairman Alan Greenspan said on Tuesday that the worst of the housing adjustment was over, and that he was preparing to publish an analysis of the "serious dispute" over the true effect of mortgage wealth on consumer spending. Housing starts and other data indicated the dampening effect that a slow housing market had on gross domestic product was at its maximum in the third quarter, when growth slowed to a weaker-than-expected 1.6 percent annual rate, he said at an investor conference organized by investment bank Friedman, Billings, Ramsey Group Inc.
Greenspan said he expected inventory levels to come down at a "reasonably rapid pace"and that "it looks as though sales figures have stabilized." But he also said there would be actual price declines in housing. "That will have some impact on consumer expenditures," he said. "We haven't seen it yet." Inventory goes down as people are laid off. Well, Chinese are laid off. China has been on the ball, the guys running that joint have been ranging about the planet, drumming up business, working tirelessly to develop other markets for they know this one is exhausted and they can't do what the Japanese are desperately doing: loaning trillions to the Americans in a frantic effort to keep their market here running. This is why the yen was the only currency to DROP when the dollar was going down. This makes no sense at all except if Japan was buying up all the dollars and instead of supporting the yen, frantically shipping the dollars here to America to be spent by our spendthrifty government which is running very deep in the red. Bernanke can't afford to EASE rates even if the U.S. economy falls off a cliff (great illustration by the way!). To ease would be to risk an acceleration in the USD free fall and a sharp (VERY SHARP) correction on U.S. financial markets (which would reverberate around the world). Bernanke knows that offshore investor confidence in USD denominated assets is VITAL. Otherwise the U.S. Government will not be able to fund its deficit. So he has to set monetary policy to suit OFFSHORE INVESTORS. The upshot: you guys might have a recession but that doesn't mean you won't see more RATE HIKES. Drowning man will catch at a straw.